Posted on April 18, 2019 at 9:50 am. 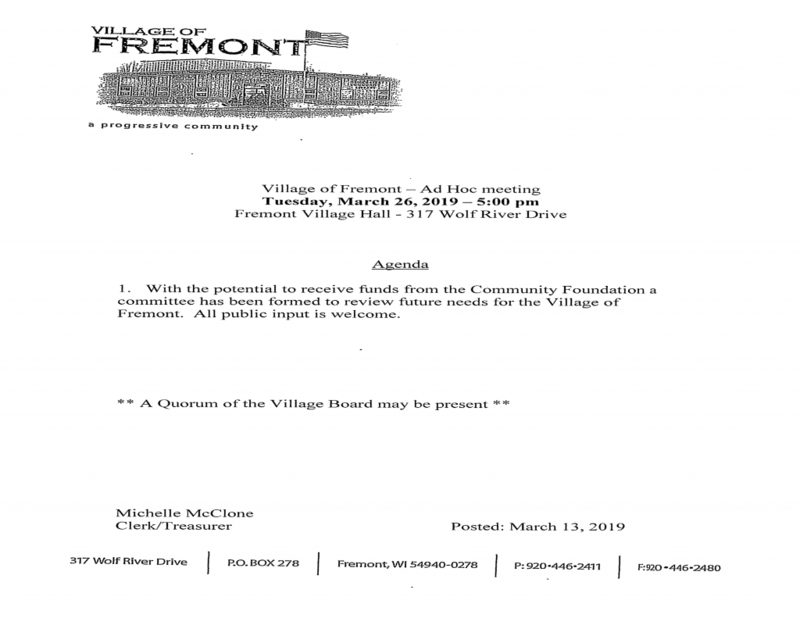 NOTICE IS HEREBY GIVEN that the Board of Review for the Village of Fremont shall hold its first meeting on Wednesday, May 15th, 2019 from 4:00 p.m. to 6:00 p.m. at the Village Hall, 317 Wolf River Drive, in the Council Room. 1. No Person shall be allowed to appear before the board of review, to testify to the board by telephone or to contest the amount of any assessment of real or personal property if the person has refused a reasonable written request by certified mail of the Assessor to view such property. 2. After the first meeting of the board of review and before the board’s final adjournment, no person who is scheduled to appear before the board of review may contact or provide information to a member of the board about the person’s objection except at a session of the board. 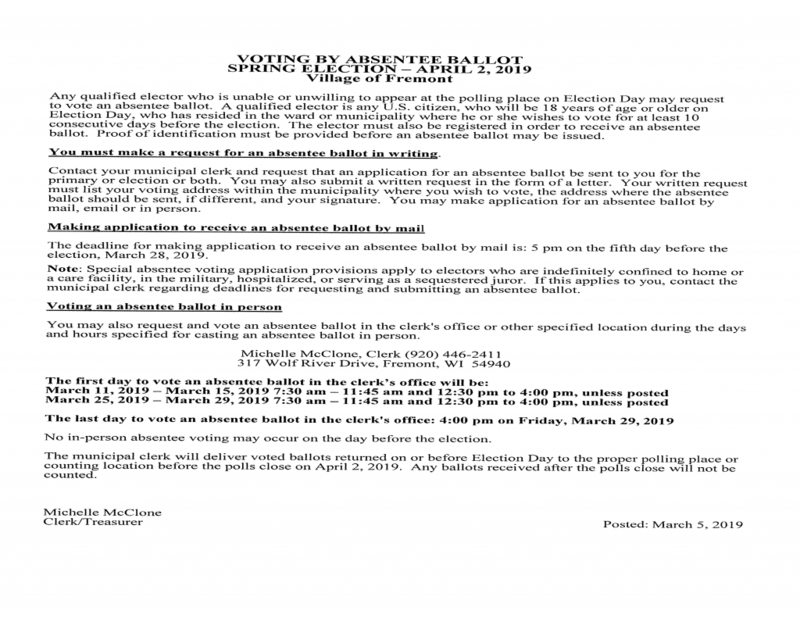 for failure to meet the 48-hour notice requirement and failure to appear before the board of review during the first 2 hours of the first scheduled meeting. 4. Objections to the amount or valuation of property shall first be made in writing and filed with the clerk of the board of review within the first 2 hours of the first scheduled meeting, except that, upon evidence of extraordinary circumstances, the board may waive that requirement up to the end of the 5th day of the session or up to the end of the final day of the session if the session is less than 5 days. The board may require objections to the amount or valuation of property to be submitted on forms approved by the Department of Revenue, and the board shall require that any forms include stated valuations of the property in question. Persons who own land and improvements to that land may object to the aggregate valuation of that land and improvements to that land, but no person who owns land and improvements to that land may object only to the valuation of that land or only to the valuation of improvements to that land. No person may be allowed in any action or proceedings to question the amount or valuation of property unless the written objection has been filed and that person in good faith presented evidence to the board in support of the objections and made full disclosure before the board, under oath, of all of that person’s property liable to assessment in the district and the value of that property. The requirement that objections be in writing may be waived by express action of the board. 5. When appearing before the board, the person shall specify in writing the person’s estimate of the value of the land and of the improvements that are the subject of the person’s objection and specify the information that the person used to arrive at that estimate. 6. No person may appear before the board of review, testify to the board by telephone, or object to a valuation if that valuation was made by the assessor or the objector using the income method of valuation, unless the person supplies the assessor with all of the information about income and expenses, as specified in the assessor’s manual under Section 73.03(2a), that the assessor requests. The Village of Fremont shall provide by ordinance for the confidentiality of information about income and expenses that is provided to the assessor under this paragraph and shall provide exemptions for persons using the information in the discharge of duties imposed by law or the duties of their office or by order of a court. The information that is provided under this paragraph, unless a court determines that it is inaccurate, is not subject to the right of inspection and copying under Section 19.35(1). 7. The board shall hear upon oath, by telephone, all ill or disabled persons who present to the board a letter from a physician, surgeon or osteopath that confirms their illness or disability. No other persons may testify by telephone unless the board, in its discretion, has determined to grant a property owner’s or their representative’s request to testify under oath by telephone or written statement. 8. No person may appear before the board of review, testify to the board by telephone, or contest the amount of any assessment unless, at least 48 hours before the first meeting of the board, or at least 48 hours before the objection is heard if the objection is allowed under Section 70.47 (3)(a) that person provides to the clerk of the board of review notice as to whether the person will ask for the removal of a member of the board of review and, if so, which member, and provides a reasonable estimate of the length of time the hearing will take. Notice is hereby given this 18th day of April, 2019. Posted on April 18, 2019 at 9:49 am. 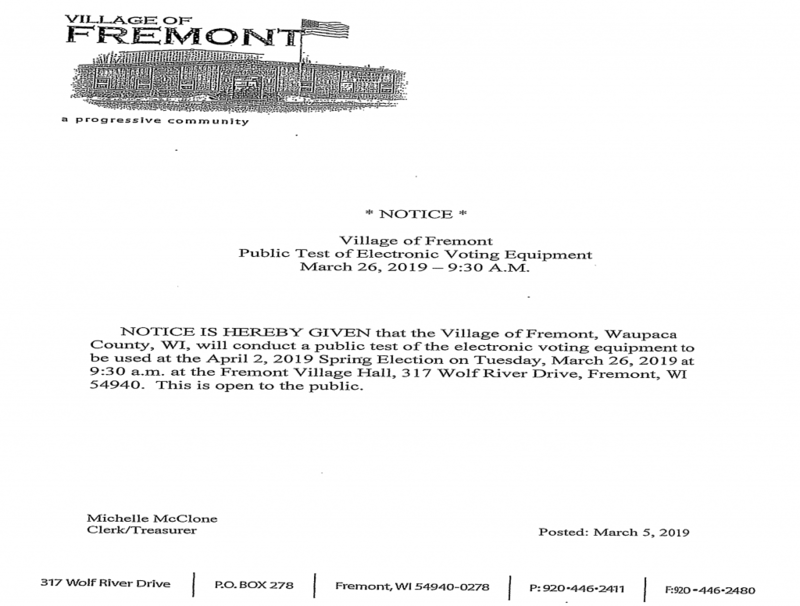 NOTICE IS HEREBY GIVEN that the assessment roll for the Village of Fremont is open for inspection in the Clerk’s office at the Fremont Village Hall, 317 Wolf River Drive. FURTHER, BE ADVISED that the Assessor for the Village of Fremont will be present on Monday , May 6, 2019 from 10:00 a.m. until 12:00 p.m. in the Council Room at Fremont Village Hall and at said meeting instructional materials shall be available. Posted on April 2, 2019 at 8:57 pm. Posted on March 13, 2019 at 2:12 pm. The village has purchased some sand bags and sand for any emergency needs. They will be available starting Friday, March 15, 2019. The sand and bags will be located by the extra garage behind the Village Hall. If you have any questions you can call the Village Hall or Dan Sambs. Ad Hoc Meeting, Tuesday, March 26, 2019 at 5:00 pm Public input welcome and appreciated. Posted on March 13, 2019 at 1:35 pm. Posted on March 5, 2019 at 3:21 pm. Posted on March 5, 2019 at 11:04 am. Posted on February 13, 2019 at 1:07 pm. Posted on February 13, 2019 at 1:04 pm. The Village is looking to fill two appointment positions. Each position is a 3 year term. Looking for a member to fill a Planning Commission seat and a Zoning Board of Appeals. Posted on November 19, 2018 at 2:14 pm.